Here’s what people are saying about BarkU! Bark U is hands down the best program for puppies/dogs. Christine the owner, is kind, loving and a great trainer. My dogs can’t wait every week to go with her. 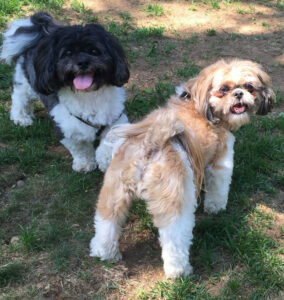 Bark U’s Enrichment Program has taught my dogs to socialize better with other dogs and people too. Would never send my dogs with anyone else! Highly recommend! Thank you to Bark U! Christine Egbert of Bark U is the reason we were able to get through the initiation phase of having a dog/puppy for the very first time. 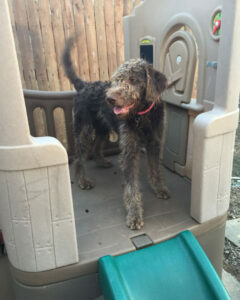 Christine’s innate sense of understanding of what Caffee (our 11 week old Labradoodle) needed and how to explain that to us was not only instructive and organizing but calming of our “new dog owner” concerns. She has a wonderful way of anticipating what is to come so that you feel ahead of the game. She is committed in the deepest way to her clients. Once Caffee rolled in poop and we were struggling to get her hosed off. Christine insisted on coming that Sunday to help us. That is just the kind of person she is. Finally, she is also very ethical in that she puts the dog’s needs and the owner’s needs first and foremost. I have referred friends to Christine and they are all so grateful to have her guiding expertise. I recommend her highly. 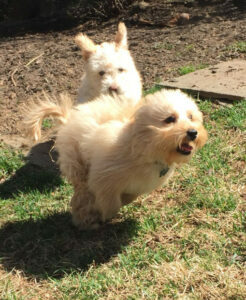 Our adorable Morkipoo Tucker has been with been with Bark U since he was 3 months old. Tucker definitely has come a long way in becoming comfortable with other dogs & people, and is progressing with the commands.He is a very happy & tired puppy when he comes home! … so we know that he has fun puppy days at Bark U! We very much appreciate Christine’s knowledge, patience, and guidance with our family & Tucker… it is obvious that she & her team enjoy & work well with the pups. Thank you very much to Christine & her team! On our recent cruise vacation we used Bark U’s boarding service. It was comforting to know that Tucker was well taken care of, & was having fun socializing with other pups while we were away. We are also utilizing Bark U’s Private sessions. We found this to be a great time to brush up on basic commands, learn how to teach new commands to Tucker, as well as problem solving. We are happy that Tucker is on his way to becoming a happy, social, & respectful part of our family! Thank you again to the Bark U team! Granted everyone that comes to my door gets an enthusiastic welcome from our dog “Brisket” who is a Australian Labradoodle, but when Christine knocks Brisket goes bananas! This is a good thing. The only person I can tolerate my dog loving more than me is his trainer. I reached out to Christine when Brisket was about 5 months old for both training and puppy socialization. From the outset, Christine was warm and highly informative and she took a great deal of time to listen to our issues. With Brisket Christine quickly developed a fun, engaging and always positive rapport so we saw progress quickly! The dogs she cares for know they will be handsomely rewarded for good behavior and are thus very eager to please. In addition to training we have utilized Bark U for both daycare and boarding. Kennels just don’t hold a candle to being loved and cared for in Christine’s home. Christine is smart, experienced, safe, and she loves what she does. I can’t say enough good things about Christine and Bark U! Christine is very knowledgeable and cares very much about the dogs. I was very impressed with her approach and experience. From day one I knew she was the right person along with the Bark U team to train my puppy named Belen. It was very important to me that our dog trainer was a fit with our family and that we could trust them. Christine and the Bark U team have surpassed my expectations. I am very proud to say that Belen is 9 1/2 months and is a proud graduate of the puppy training program. She is currently enrolled in their “Enrichment program” and also in their doggy day care a few days a week. I would highly recommend Bark U. I even enrolled my 3 year-old Bichon Frisee named Claude in the doggy day care a couple days a week for socialization. When Belen and Claude hear Christine’s van they go crazy and can’t wait to start their day with the Bark U team. I am very grateful for all the care, patience, love and training they give my dogs. Than you for all the great tools and advice you have given me to use with my dogs. I have nothing but great things to say about Christine and her puppy program at Bark U. Christine’s insight into our puppy Marley was spot on. Marley began to exhibit some anxious behaviors (barking at neighbors, refusing to go down stairs, fixating on fireflies outside our window, jumping at strange noises…) and Christine’s positive instruction, helpful techniques, patience and genuine affection for our dog have helped him tremendously. Marley has developed into a social, friendly puppy who happily goes up and down stairs, has more tolerance for noise and is certainly less guarded. When Marley graduated the puppy program, I was so thrilled by his achievements that we continued to have Christine take him for socialization once a week. Christine continues to follow up with me by phone and e-mail to report on Marley’s progress and/or address any questions I may have. She’s thoughtful and thorough. I highly recommend her!